As global warming advances, much of the planet’s most vulnerable population is already seeing its livelihood affected. In some cases, the effect is so strong that people must uproot their lives entirely and join the growing ranks of the world’s environmental refugees. 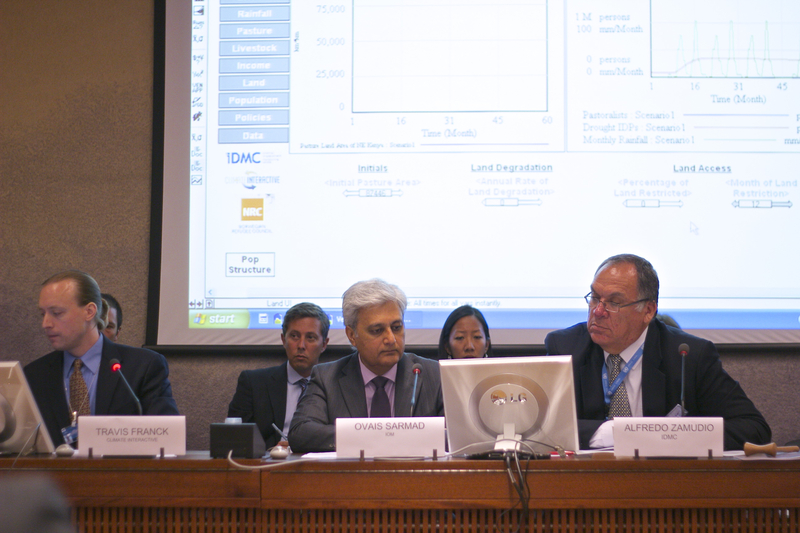 (From left) Dr. Travis Franck, Ovais Sarmad from the International Organization for Immigration (IOM) and IDMC Director Alfredo Zamudio present Climate Interactive’s new simulation before the UN. It was in this context that Climate Interactive showcased some of our latest climate tools at the United Nations Economic and Social Council (ECOSOC) Humanitarian Affairs Segment in Geneva last month. Presented by Dr. Travis Franck, the Kenya Pastoralists Drought-induced Displacement Simulator seeks to apply systems thinking to policies aiding environmental refugees in Northeast Kenya. As pastoralists who live off the land are increasingly displaced by droughts in this part of the world, governments and humanitarian organizations are hoping this model will help them develop the appropriate adaptation strategies. “We’re using a model that’s never been used in this arena before,” Franck says. The simulator, which Climate Interactive developed in conjunction with the Internal Displacement Monitoring Center (IDMC), allows users to create various “what if” scenarios by adjusting human, economic and environmental variables such as rainfall, pasture quality, income and international assistance. Then, in real time, the simulation generations reports on the amount and rate of displacement under these scenarios. Systems thinking is known to reveal counterintuitive effects, so some of the models outcomes may be surprising to users. With funding from the European Union, Climate Interactive and the IDMC are currently expanding the Kenya simulation to incorporate bordering regions in Ethiopia and Somalia and extend the simulation’s time horizon to 2040. The hope is to equip the Horn of Africa, one of the world’s most vulnerable areas to droughts, with an adaptation tool enabling it to manage the unavoidable effects of climate change that have already set in.